The leader of the UK Independence Party (UKIP) Nigel Farage has admitted he doesn’t believe himself capable of running the country, despite leading one its most prominent parties. While Farage is hoping UKIP will make dramatic gains in the general election on May 7, he clearly doesn’t believe he possesses adequate leadership skills to run the country. The party leader used his appearance on the show to spin a positive light on some of UKIP’s more controversial policies. 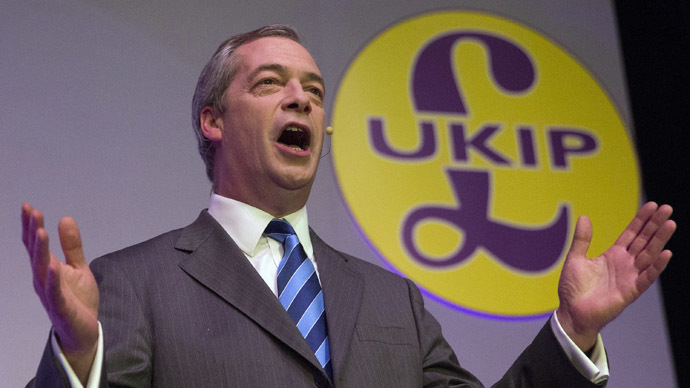 He argued that immigration, something UKIP pledge to drastically reduce, had had a positive effect on Britain’s cuisine. “If you control immigration sensibly and do it properly it can be a benefit to the country and it can enrich the culture too, no arguments about that,” he said. Farage also showed his human side, speaking frankly about the effects of politics on his home life, and relationship with German wife Kirsten. “UKIP has been a DIY political party, I mean most of us have never been involved in politics before,” he said. Kirsten revealed last week she had become solely responsible for the organization of their household because her husband’s job meant he was often away. She added that Farage didn’t even know where basic household equipment was. “He just called me and asked where do we keep the ironing board as he needed to iron his shirt,” she said. “I'm not that surprised. It is a bit worrying,” she said. He added the family might have benefitted if he hadn’t gone into politics. Farage’s personal interview comes as another UKIP parliamentary candidate is facing an internal party investigation over a fresh social media blunder. Richard Hilton, candidate for Mitcham and Morden, southwest London, is being investigated after posting a message claiming Mohammed Emwazi, recently identified as Islamic State executioner Jihadi John, should have killed himself. He removed the tweet and later posted an apology on his Facebook page. “‘Jihadi John’ of Islamic State is one of the most evil men on the planet and the world would be a better place without him. “I was not advocating suicide and as I realized the tweet could be misconstrued I deleted it.